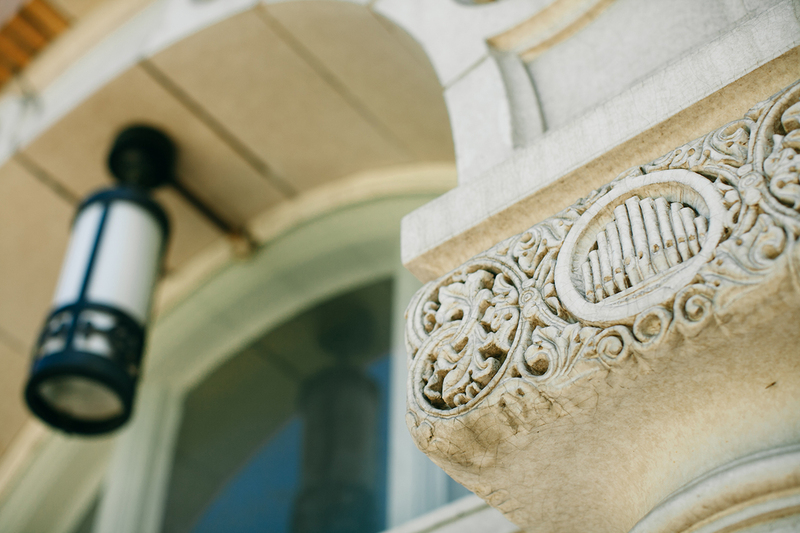 "It’s a real addition to the musical tapestry of Cleveland." 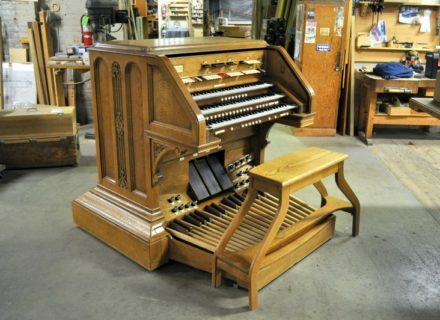 Although the entrance to the Holtkamp shop was unusual, it felt appropriate: through a side cargo door, and into the open frame of a brand new organ. 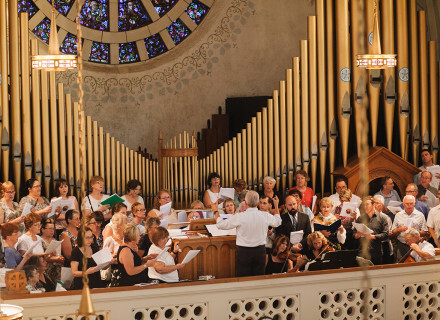 Chris Holtkamp, President, Artistic and Tonal Director of the Holtkamp Organ Company, guided us through their archives, his grandfather's legacy, the history of St. Vitus' organ and its importance among organs in North America. Our conversation took place in Chris' office, which is lined with shelves of documents and photographs that span the construction of each Holtkamp organ, and powered by his encyclopedic knowledge of what makes them sing. 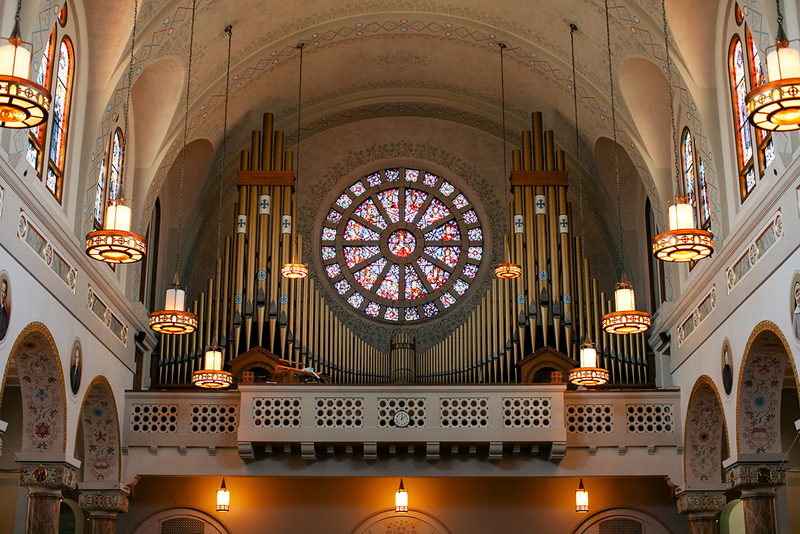 What makes St. Vitus’ Holtkamp organ so unique? 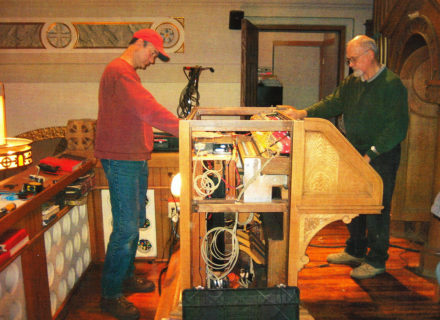 Chris Holtkamp (CH): The organ precedes a series of three organs in my grandfather’s new style of building. 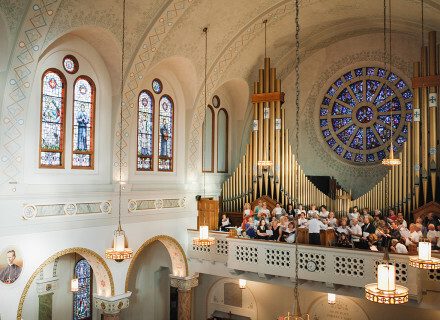 Basically, it took the organ out of the chambers or closets, in which they were typically placed in the 1920’s and 1930’s, and instead put the organs out in the room so that there wasn’t any acoustical impediments to the sound getting out. If you put something in a side-chamber or closet, what happens is that the sound gets filtered. Most of what you get when it’s in the chamber is a lot of fundamental [tone], but not a whole lot of color. 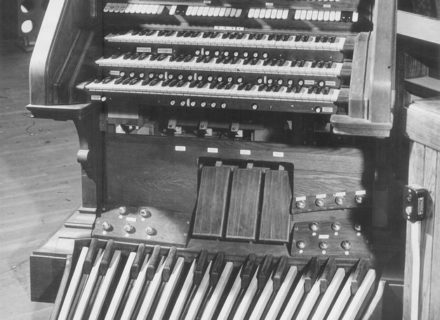 John Allen Ferguson, the guy that wrote the biography on my grandfather (Walter Holtkamp: American Organ Builder), said there were five organs between 1933 and 1934 that were the first instruments that fully represented that change. One of them, which is still in existence, is in Covington, Kentucky. Another one was at Miles Park Presbyterian Church, on Cleveland’s south side at that time. However, [St. Vitus’] was the direct predecessor to them. 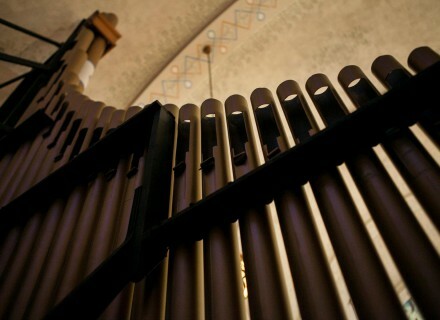 When you listen to the organ you hear a lot of sounds that are characteristic of organs in chambers. 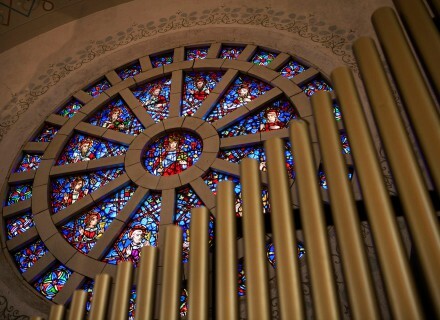 But you also hear a lot of sounds that are headed in the direction of the sound that organs in the open church produce. 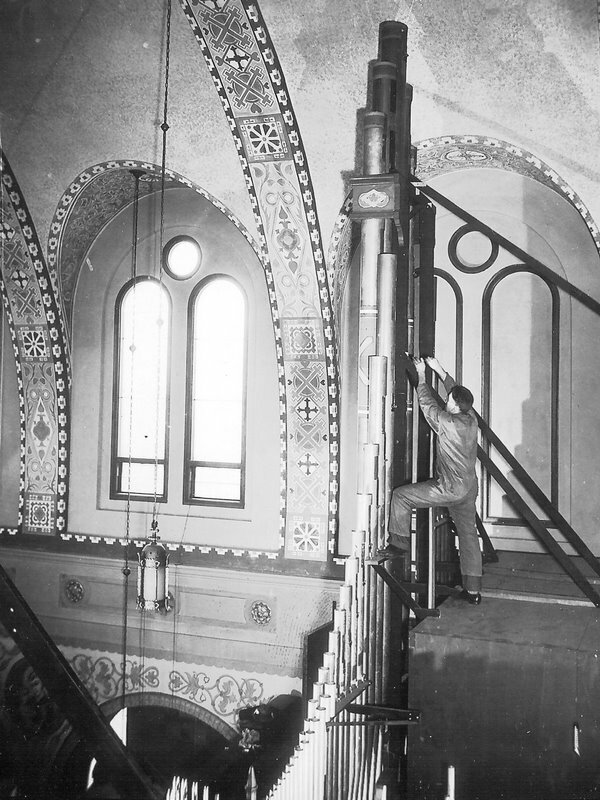 The biographer says that this started in 1934, but these [photographs & documents] show that it was completed in 1932. That shows that it started a number of years earlier, and it shows how purposeful my grandfather was in what he was designing. The change didn’t just happen with those three or four organs. It happened before them. So although it’s not known as having an important place in the history of organ building in North America, it does. The Organ Historical Society had a convention in Cleveland just before the St. Vitus organ was restored, and the American Institute of Builders is going to have a convention here in a couple of years, in Northeastern Ohio. 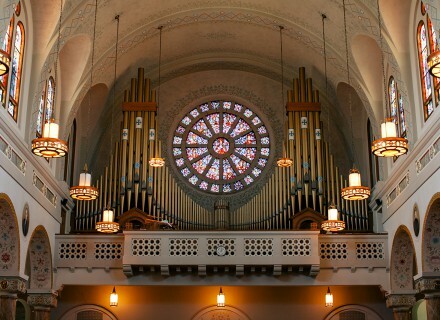 The Institute we’re having here in a couple of years should hear [St. Vitus' organ]. Is this a picture of the original installation? That’s pretty cool. 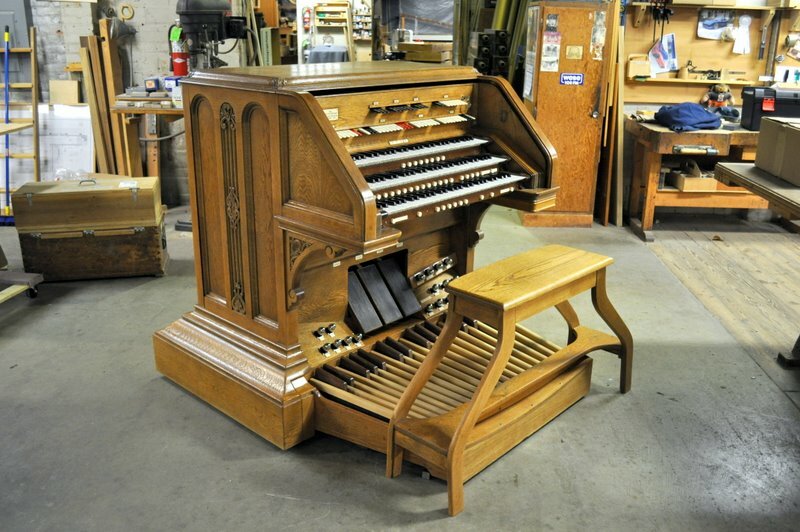 I mean, you may think I’m sort of nutso in saying that, but in terms of where it happens in the history, not only of organ building in our shop, but also in terms of organ building in North America. That’s because the change is so big. 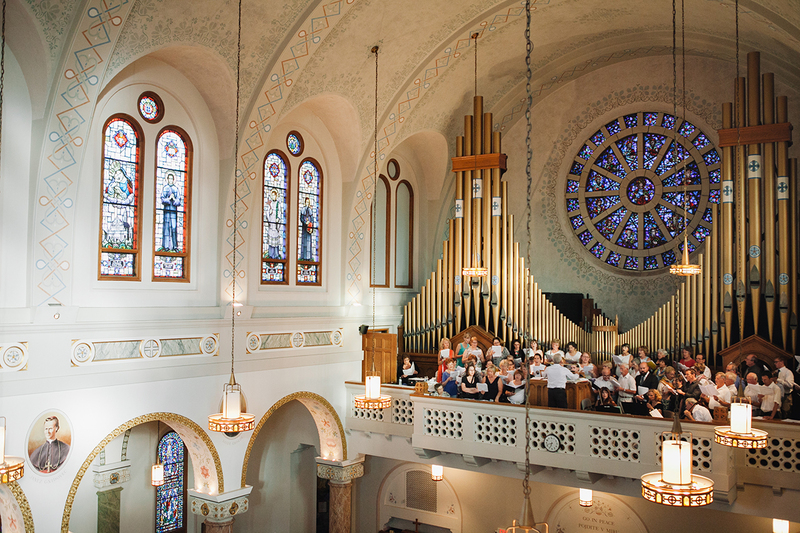 If you go and listen to an organ–there’s one down in Shelby, Ohio, at the Most Pure Heart of Mary–and the tone colors are totally different from what [St. Vitus] has. Totally different. There’s one up in Detroit, at Mount Zion, from 1928. It too was very different. There’s one in Vermillion, South Dakota–do you know how long it would take to get to Vermillion, South Dakota in 1927? 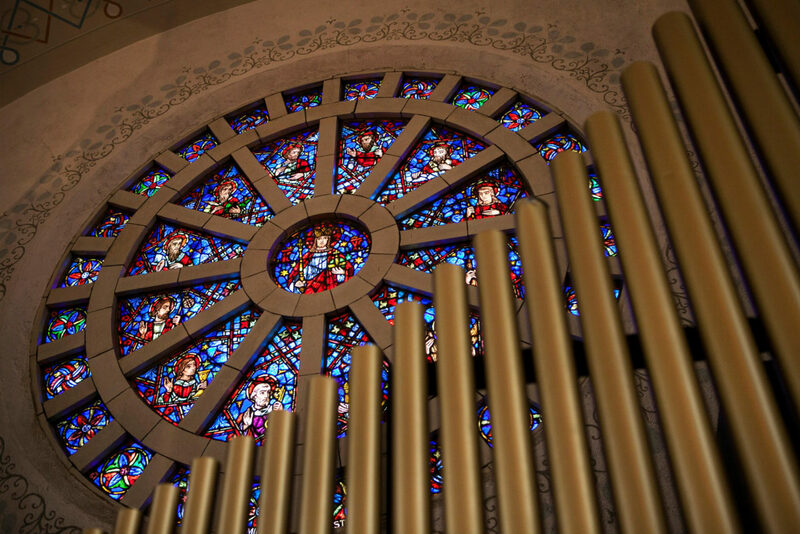 The type of organ is the same, it’s a Catholic Church organ, but the sound is totally different, and [St. Vitus’ organ] was the first indication that we can find of [my grandfather] going in the direction of a very new sound. 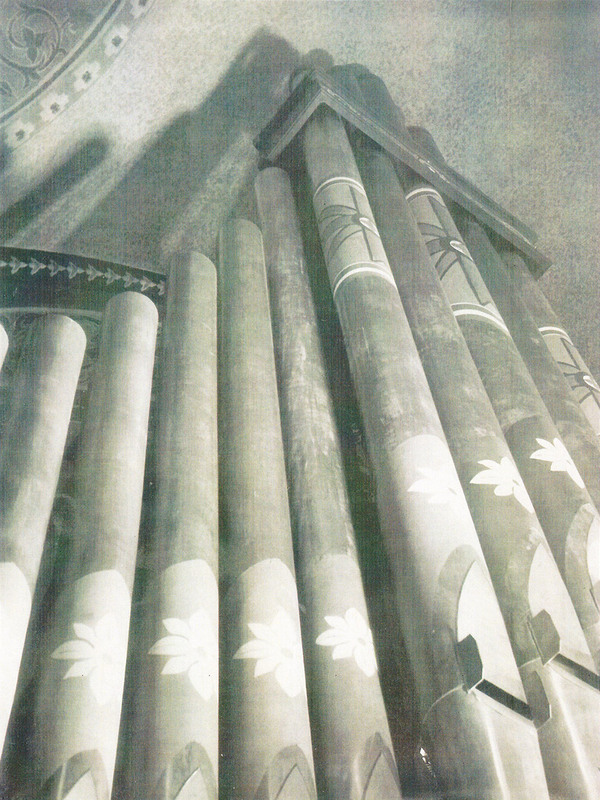 (Chris pointing towards original photographs) There are also pictures of guys–the hero shots–in the organ. Pictures of the original console, which we tried to copy in restoring the console. Here’s another view of the pipes. 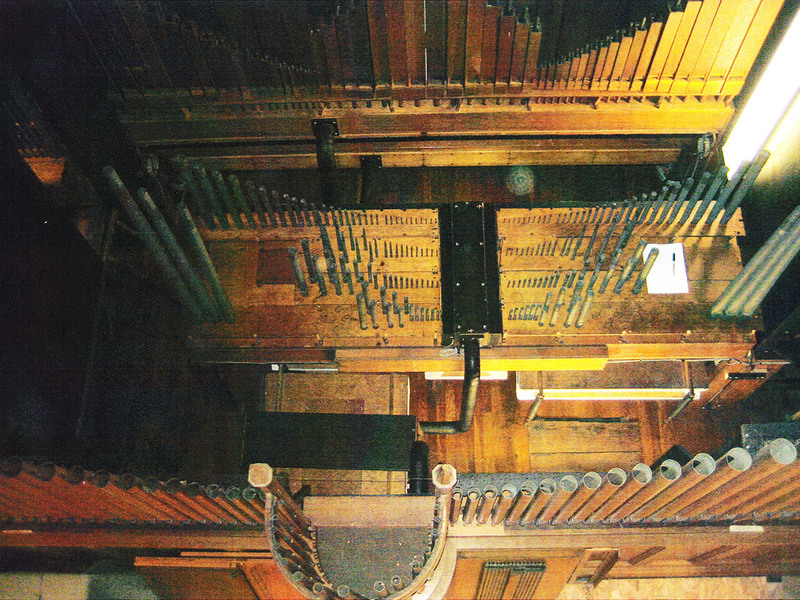 These are the actual sample pipes that were used to produce the pipes that would be in the organ. They’re all from the same stops. The same kinds of pipes. And it was all plugged into this board here? CH: Wow, he made a freaking keyboard? Yeah! Wow – and it had a combination action. 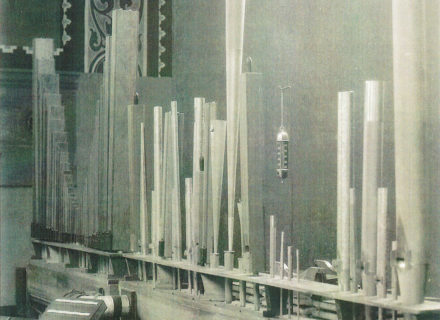 CH: So, part of it was that the organ needed to be be restored. I think the reason [St. Vitus Church] decided to go in this direction, as opposed to trashing it, was partly because they had this feeling that it was important historically, but also because they had a firm belief that music made in the Catholic Church on a pipe organ is far superior to music made in the Catholic Church on an electric organ. That it leads the congregation and accompanies the choir much more effectively. That’s the main reason they did what they did. And it was in such bad shape–you couldn’t do it piecemeal. It was just, “Haul the whole thing out, restore it, put the whole thing back in.” That was a great job. How much was there to restore, visually & acoustically? CH: There’s way more in the organ besides the stuff you can see in the visual design of it. There’s a ton of stuff behind it. Repainting the pipes was maybe 2% of the project. The rest of it was all behind them. For a long time, it functioned only in-part. The mechanical parts of the organ were defunct. They had gotten so old, that they didn’t work properly. 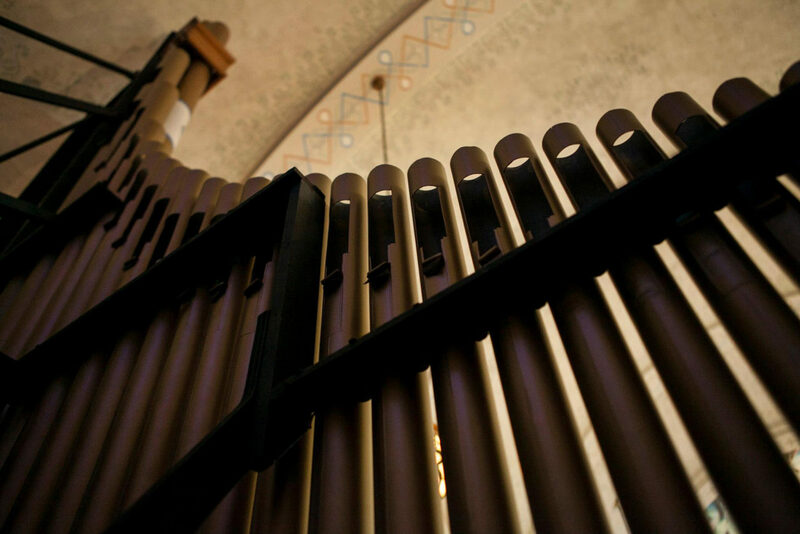 Every organ has a lot of thin leather in it, and the thin leather is an important part of the valving system for each note in the pipe organ. When the leather gets dry and brittle, it doesn’t do its job properly and then the notes don’t play–or they play all the time. One or the other. The other major part of it were what we call wind chests, which are these big wooden boxes that the pipes sit on. Inside the wooden boxes are the valving mechanisms that allow the pipes to play at the appropriate time. We needed to restore those chests. We needed to clean and restore the pipe work. We needed to restore the whole wind system, all the bellows. Before we even started the project proper, we put in a new blower and rebuilt the blower room. 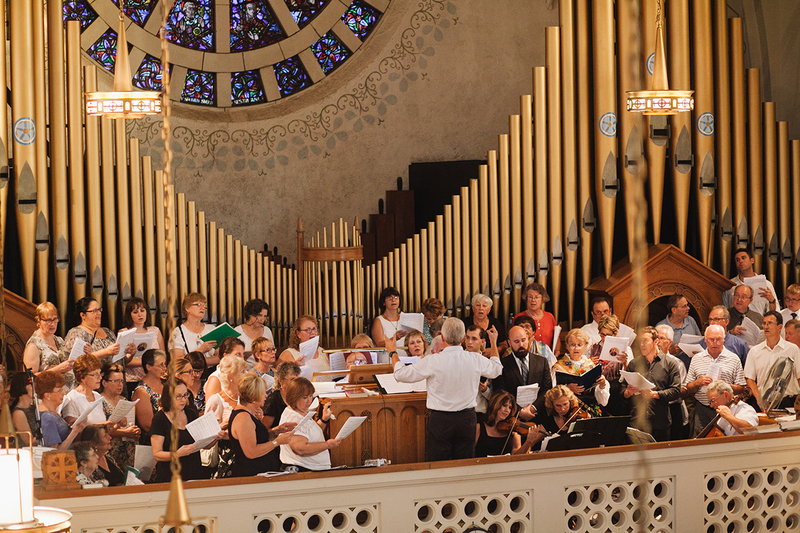 What do you remember most about restoring the organ? CH: One thing that stands out in my mind is getting the console back to where it looked and played correctly. It was a wreck. I mean, it has all new keys. The keys were shot. The pistons–the little white buttons you press with your thumb–they were gone! Somebody had just taken them out! Yeah, it was a wreck. (Laughter) So, anyways, restoring the console. It is such a unique console in its visual design, it’s just beautiful. That to me was maybe the most memorable thing. Another thing that stands out over the years is that we hadn’t worked on the organ in forever. 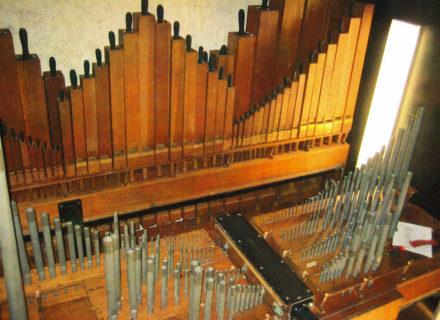 So, they had other people working on it, and this one guy decided he was going to try and take two sets of pipes and make them into something different–tune them differently–and he totally screwed it up. So the pipes were really screwed up. But figuring out how to bring them back to what they were originally, to restore their original sound, was for me a very interesting and satisfying process. To this day, it’s a project I very much loved. The fact that it now speaks well and reliably, it’s a real addition to the musical tapestry of Cleveland. Even though maybe it’s not known that widely, it really is. 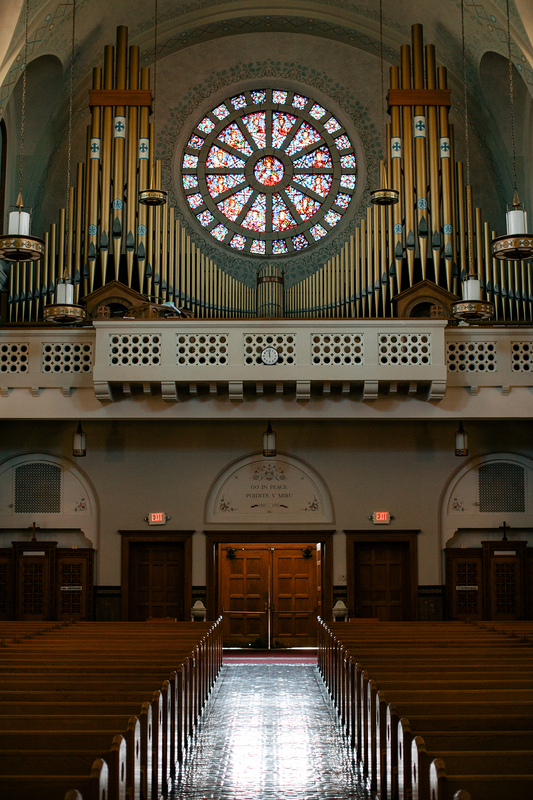 For more information on the design of the organ and the restoration project, please visit the Holtkamp Organ Company's website. 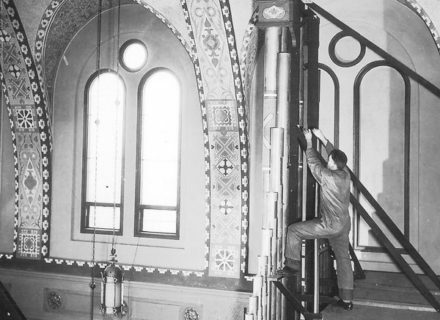 A visual history of the organ, from its original installation to its restoration and condition today. 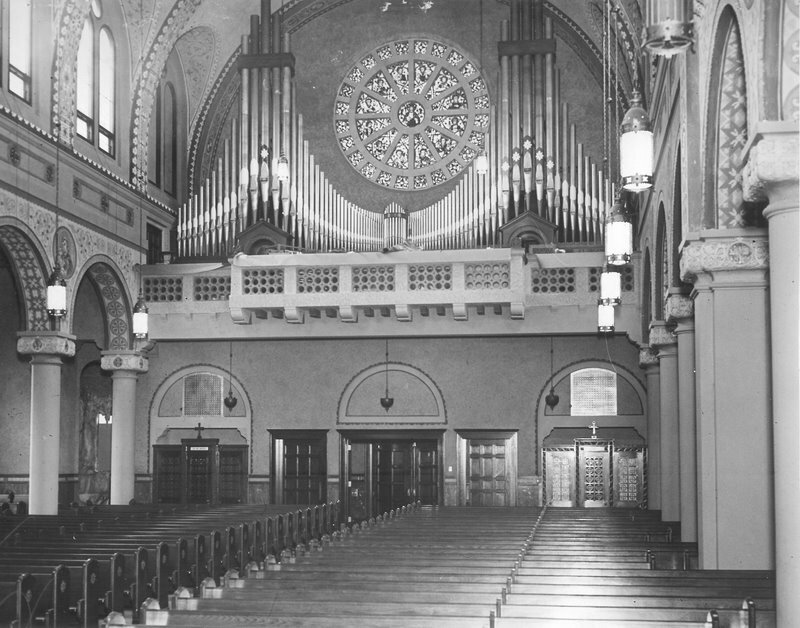 The interior of the church, just after the Holtkamp organ was originally installed. 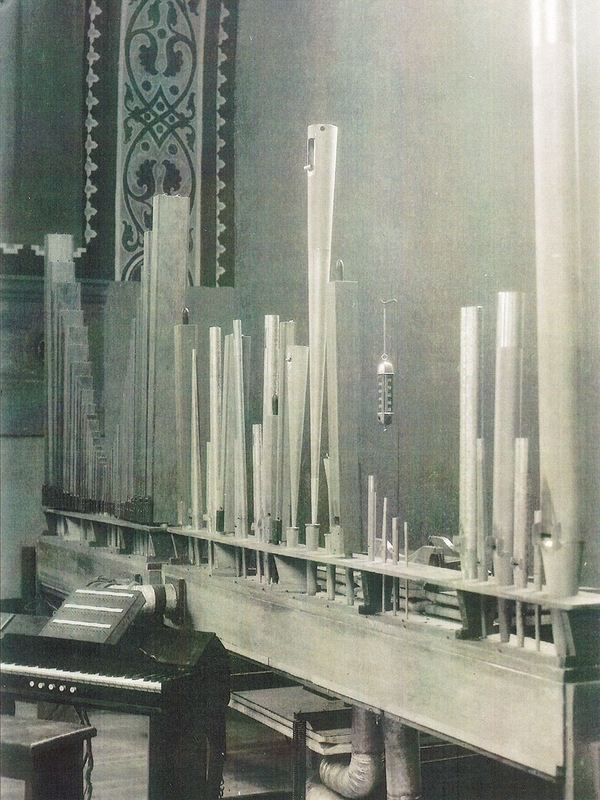 From the original installation of the Hotlkamp Organ at St. Vitus Church in 1932. 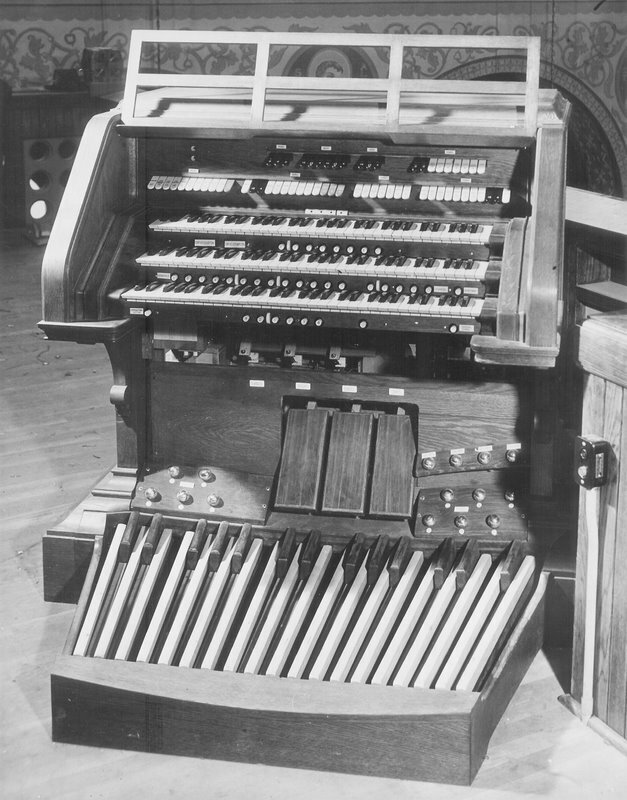 The original console used to play the organ, just after its installation in 1932. 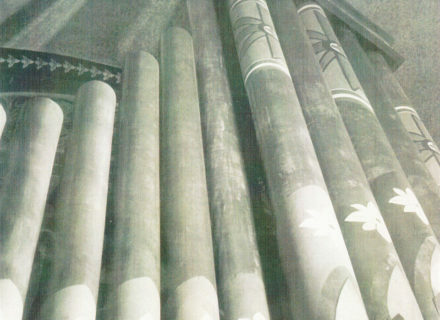 Original graphic design details on the organ pipes. Sample pipes used prior to the organ’s installation in 1932. 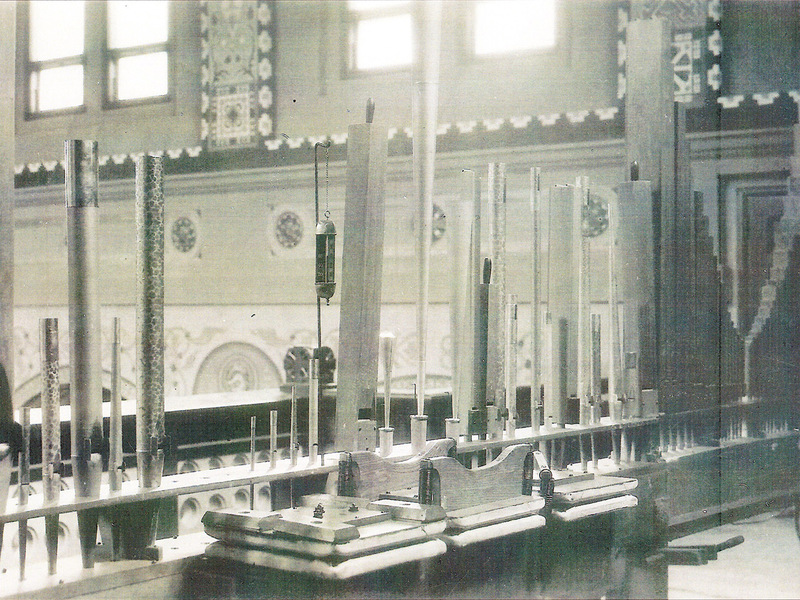 Sample pipes being tested, prior to the organ’s installation in 1932. Behind the organ, during its restoration by the Holtkamp Organ Company from 2008-2009. 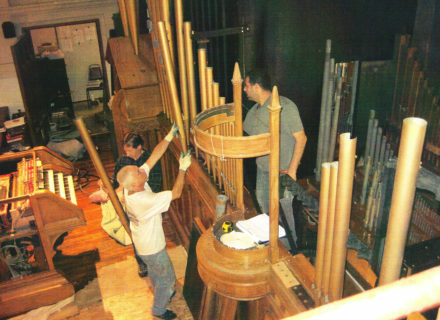 The organ during its restoration by the Holtkamp Organ Company from 2008-2009. The restored console being installed by the Holtkamp Organ Company. The restored organ console, in the Holtkamp Organ Company’s shop. 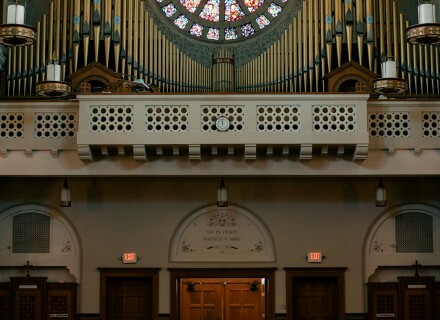 View from behind the Holtkamp Organ. Full view of the church, from the perspective of the altar. 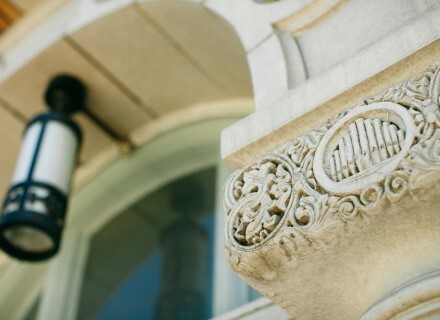 Relief detail of a pipe organ on the entrance to the choir loft.